After producing the world's most renown series of compressors, the task of producing a new compressor worthy of our reputation would be daunting for most engineers. Not for dbx®. 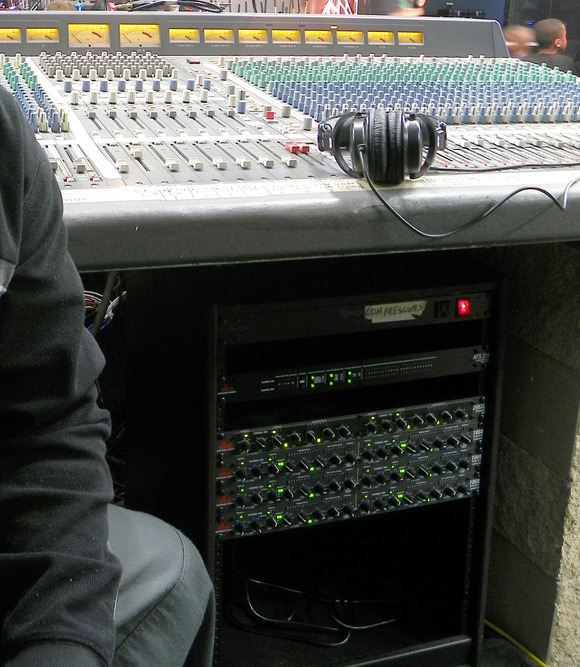 Our engineers know audio like no one else in the world. Now the fruits of their talents are available to you in the form of the 1066 Stereo Compressor/Limiter/Gate. Want to instantly add that classic dbx response to your mix? It's there at the touch of the "Auto" button. Or use the independent Attack and Release controls to tailor the 1066 to your specific needs. Unwanted frequencies or mic bleed in the signal path? Frequency dependent gain control is a snap to set up and execute with our Side Chain External button (SC Ext). Use the Side Chain Monitor button (SC Mon) and your favorite EQ to dial in the specific frequencies you want to trigger the device. As has become our standard, the contour switch allows entire mixes to be easily smoothed with soft compression while keeping low frequencies from punching holes in the overall mix. Selectable input and output metering allow you to make sure that everything is matched up level-wise, maximizing your signal-to-noise ratio. For overall speaker protection, our new PeakStopPlus™ does all previous circuits one better. With a new design, the PeakStopPlus represses those unwanted transients from blowing your drivers while minimizing the distortion common to many other "hard" limiters. Selectable Hard-Knee or OverEasy® characteristics make the 1066 ideal for your gain control needs, whether you're looking for "heavy" almost-special-effects compression or soft, smooth gain leveling. New lightpipe technology replaces standard LED's found on most other units, making the 1066 both very easy to read and much easier to operate. In the studio, broadcast facility or on the road with a P.A. system, the 1066 is designed for perfectly simple operation. The 1066 allows you to eliminate unwanted signals, flexibly control overall signal gain and guard your overall mix in dual mono or stereo operation. At the heart of the 1066 is our new dbx V2 VCA. Developed especially for the 1066, 1046 and other 10 series products to come, this revolutionary VCA boasts superb dynamic range characteristics while maintaining very low distortion and almost immeasurable noise characteristics. The bottom line is this: a new VCA working in conjunction with world class design makes the dbx 1066 perform better than compressors selling for hundreds more. State-of-the-technology VCA's, meticulous component selection, and scrupulous testing procedures are just a few more reasons that the new dbx 1066 is the latest in a long line of pedigreed dbx signal processors. Bypass Switch Activates the direct input-to-output hard-wire relay bypass. Relay automatically hard-wire bypasses unit at power-down and provides a power-on delay of 1.5 sec. Where can I go to learn more about the compressors controls and see some example settings? Make sure to read the owners manual for your product. Most do have example settings and an explanation of the different controls. For further information and example settings please see the Compression 101 White Paper.